A high-intensity workout boosts focus, flexibility and agility — and it’s definitely high-intensity. WHEN COACH Richard Wells reached out to me about a boxing class for those who had Parkinson’s disease, I was curious. I knew boxing training was a great overall workout, but how does it help people with a nervous system disorder? I found many folks at Arcaro Boxing Gym in Seattle willing to educate me on the topic. Brian Power, a physical therapist at nearby MTI Physical Therapy, volunteers at the class to support the regulars. 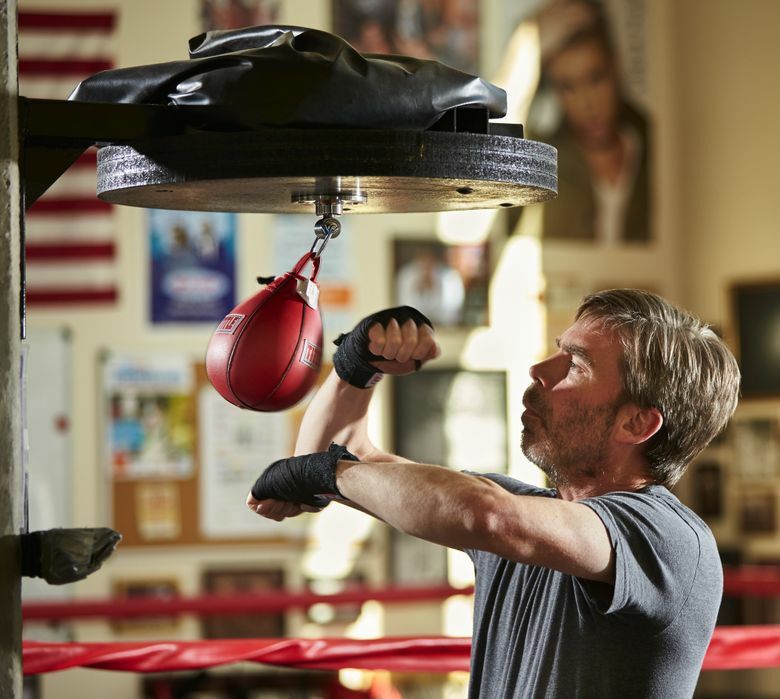 The rhythm of punching a bag mixed with music helps people with Parkinson’s focus; it works their flexibility and coordination and challenges agility. The intensity helps with tremors, he says. And, it’s noncontact for the participants. All right, then. Let’s box. I joined the class, which is structured as three minutes on, 30 seconds off, for 17 rounds. Wells started us off with a jump-rope warm-up, and had us play around with jumping in a circle or doing cartwheel-style jumps to keep us challenged. The intensity was high, right away. We did more warm-ups, including side leg lifts; balances on one leg; and walking around the room, going from ball of the foot to heel. I was ready by the time we wrapped our hands, pulled on gloves and moved to the punching bag. Our job was to work on footwork, and punch, moving forward and back. My bag kept spiraling, and Brian told me to hit faster to keep it from swaying side to side. We added a jab to our punch combination. I was getting tired, and glanced over at the regulars. They were focused, and strong. After a couple of rounds with the bag, Wells had me work with another volunteer on boxing with a partner holding a defensive shield, while regulars Carl Carter-Schwendler and Peter Hussey, who were more experienced, moved into the ring to spar with Brian — he doesn’t punch back. After one full round of chasing my partner around the gym, moving forward, back and side to side with the shield, I was ready for a break. I turned to the ring to watch; it was intense. All were sweating from the effort, as Carter-Schwendler or Hussey tried to land body blows on Brian. “They’re full-on trying to get me,” Brian says. Some people with Parkinson’s lose the ability to project their voice, so Brian encourages them to count punches out loud. Agility is another area that often goes, so boxing helps on that front. Wells made sure we all stayed on track with our workout. 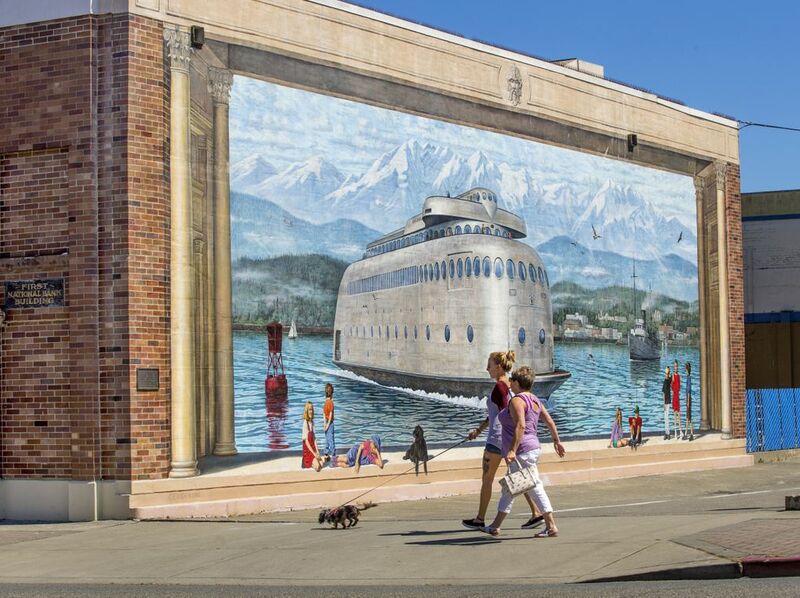 Cover story: Is Port Angeles ready to realize its potential? By the end of class, we were all exhausted. Or was that just me? Before he was diagnosed, Carter-Schwendler noticed he had a hand tremor. It worsened, and a neurologist confirmed he had Parkinson’s. Before boxing, he did physical therapy. He learned that boxing is considered effective therapy for Parkinson’s. Typical problems include tremors, slow gait or stiff muscles. High-intensity exercise is considered better than low-, he says, and studies say exercise is the best medicine. 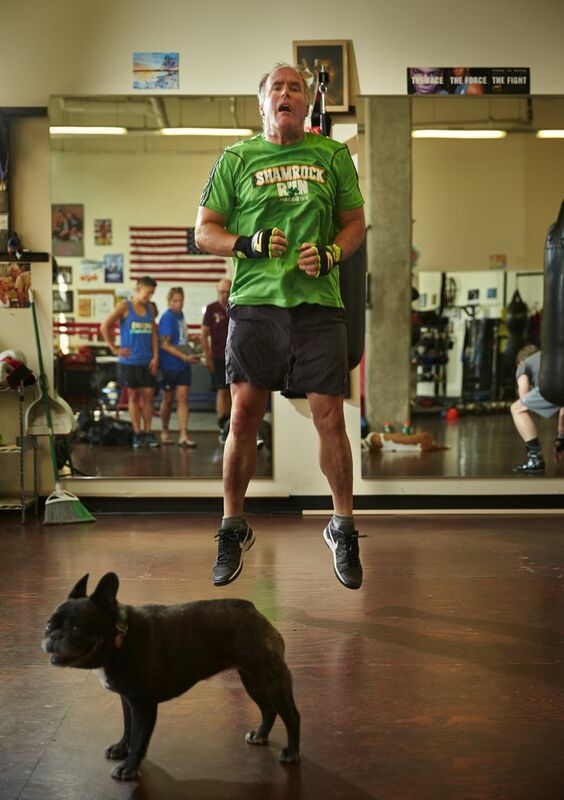 “Certainly, I’m in better shape than I’ve been since high school,” says Carter-Schwendler, who is 47. When he doesn’t box, he feels a bit more “Park-y,” he says. Plus, boxing is fun. The twice-weekly class started with two boxers, owner Tricia Arcaro Turton says, and recently added one more boxer; class size is not a factor. “Two forever is worth it to me,” she says. Nicole Tsong teaches yoga at studios around Seattle. Learn more or reach her at nicoletsong.com. Benjamin Benschneider is a Pacific NW magazine staff photographer.